SewWhat-Pro (SWP) is software for viewing, editing and converting embroidery files arising from various different sewing manufacturers. It includes various Integrated Project Management features (see the description of SewWhat-Pro features below). 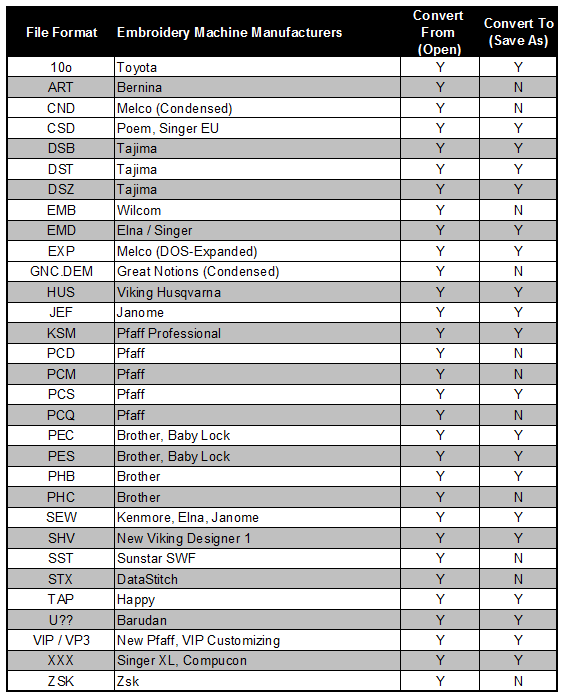 A plugin is available from myriaCross (see features list below) for converting Cross-Stitch files to embroidery files. Converts Cross Stitch patterns to embroidery files using a “plugin” from myriaCross (MC). You may download the DEMO, or purchase the MC plugin for SewWhat-Pro, here. Once the plugin is installed, it becomes seamlessly integrated into the SewWhat-Pro workspace and can be used to preview and convert a variety of different Cross-stitch formats. After updating to Windows 8/8.1, if the plugin stops working, simply uninstall and reinstall to reactive it. Error Message: "The application has failed to start because its side-by-side configuration is incorrect. Please see the application event log or use the command-line sxstrace.exe tool for more detail." Solution: This happens sometimes after Windows does an update. Just UNINSTALL SewWhat-Pro from Control Panel and then install SWP again from above. You should not have to re-enter any registration information. Solution: This usually happens when someone is trying to install on a MAC or tablet device. For MAC users - See "Important NOTE for MAC Users" above. This is not an App, so it will only download and install on devices that allow you to install programs - Example - this will not download or install on an iPad because you can only download apps on iPads. This is a list of Frequently Asked Questions [FAQs] and Answers to those questions about SWP ~ I hope it helps with your question! If you don't see what you need below, just e-mail us at customerservice@akdesignsboutique or call us 678-390-2641. Q Can I use SewWhat-Pro to convert images to embroidery files (digitize)? A No, SWP is an embroidery editing program. You'll want to download and try SewArt (click here) for your digitizing needs. Q I just did the update to my Sew What Pro software so it is now running 4.0.6 and I am very frustrated that I can no longer zoom in and out to view the full image. Could you tell me if this is going to be fixed? I purchased the software from AKDesigns several months ago and have absolutely loved it, and when I saw the update I have continually hesitated to download it but tonight I did and now I really regret it. I would really appreciate any help I can get with this. A The zoom feature on the new version of SWP has changed, but it’s still there :) There’s a slider zoom in the status pane at the bottom right of the screen. In SWP, if you go to Help, then Help Topics, click on the Search tab, then type Zoom and enter - you'll see help for the new zoom control. Purchased this program when I started embroidery with my Brother Machine and I have never had to turn down a project yet. It has everything I need. This is a wonderful product, easy to use with comprehensive support features and help directory. At an amazing price. I'm a beginner with a Brother SE400--a small machine in the world of machine embroidery. This program is wonderful!! It has enabled me to do designs, pick colors, size and center my projects with ease. Plus, Angie has been so helpful to me with any questions asked. . Tried the free for 30 days demo but fell in love with it quickly and purchased it. I highly recommend SewWhat Pro! I love my sew what pro software. This software is so easy to use to combine design and is such a time saver for me thanks so much for such a great software! Easy to purchase and download,excellent help from ak designs boutique. Program is excellent value for money and a must have for machine embroider. Love it is easy to use I recommend. What I have played with on the program and so far I really like it...It is much like the 4D program I had. I love everything about this software but for some reason the predigitized letters with different fonts won’t stitch out very well for me. Of course I amy not know the trick yet or how to fix it. It sounds like you're referring to the Lettering feature that uses the True Type Fonts and those aren't pre-digitized. The software "digitizes" them as you use them based on the parameters you provide. This feature does take some getting use to and trial and error with test stitching and making changes to the settings. I hope this helps! Love it. I am 70 and I am doing this! I purchased a larger hoop for my machine and purchased a design. My surprise was that I couldn't simply plug it in and have the embroidery start like I did with the 4x4. I went on youtube and a lady was giving a tutorial on the larger hoop. She was using the Sewwhat Pro. I realized the program was necessary and easy to understand so I ordered the full program right then.